I've got pictures for several projects just waiting to be written about, but tomorrow is the beginning of Kids Clothes Week so I'm putting those on hold and jumping in with both feet. What is Kids Clothes Week? You can read about it here, but it is basically a lot of sewers dedicating an hour (or more!) each day for a week to sewing kids clothes. 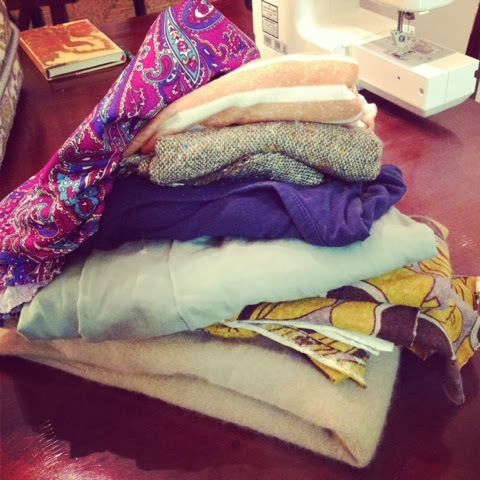 Anyone can participate- sign up here and sew along! I've wanted to join in the past but never have. This time I'm ready and I'm making it happen. I spent my spare time the past couple of weeks planning what I'd make, gathering fabric and patterns, and even cutting things out so I can pound out as many items as possible this week. I'll admit my 'to sew' list is ambitious, but I figure I'll sew what I can and the rest will get done eventually. Another Geranium for Caroline, probably a shirt rather than dress. And if I'm being really ambitious, a Nituna coat for Charly. I'm dying to make this- I just picked up a wool coat from the thrift store to upcycle. Now that I look at my list, I doubt I'll get more than half of this done. Hey, a girl can dream right? !